It was shared among Native Americans with two cultural components that described how to grow it and how to eat it. Grow it alongside beans to replenish nitrogen in the soil. Eat it after it has been soaked in an alkali solution that transforms the protein into a digestible form and boosts other nutrients, like the essential, niacin, a B vitamin, without which humans develope the disease, pellagra. This important scientific, “molecular” process is called nixtamalization, from the Nahuatl language. When corn was transported to Europe in the 1500’s, it traveled as a product dislocated from its history and culture. That was too bad because when you see only the product, you don’t know how to grow it nor how to eat it. Eating corn without the process of nixtamalization caused widespread famine and, of course pellagra. Unfortunately, today in the US this important iconic food is still removed from its culture and not fully understood. There are a growing number of US chefs and home cooks who understand the nature of the corn tortilla, aware that it is a cultural heritage. We insist on cooking it in the traditional way that foregrounds its natural flavor, texture, and aroma. In most fine-dining restaurants, it is not the Chef of the starred restaurants, but rather the Latino/a line cooks who are the ones who truly understand the nature of this food. They learned it at home, their cultural roots. If you’ve never had a real corn tortilla, try this recipe and, my goodness, your mouth enjoyment will be a revelation. 4 cups nixtamalized corn flour. You’ll probably have to buy the only brand being sold in most stores, the Mexican brand, Maseca, which Greenpeace Mexico says is made with genetically modified corn. Well, most of our US grocery store food has gmo’s. 1. Add the salt to the flour and mix it in, then add the water slowly as you mix with your hand to form a soft dough. It should feel softer than play doh. Add a little more water or flour as necessary. Cover the dough with a damp cloth and let it stand for 20 minutes to make sure the corn is thoroughly re-hydrated. At this stage you’ll notice the nice aroma of the corn. Make little balls with the masa and keep them covered with a damp cloth. Use the tortilla press to shape them, using a plastic sheet to keep it from sticking. 3. Make 30 balls and flatten them, one by one, using a tortilla press lined with plastic. The best plastic to use is a grocery store bag. Fold the plastic so that you have 2 layers and cut a piece that covers the surface of the press. 4. To flatten the corn tortilla, cover the bottom of the tortilla press with one half of the plastic and place one of the balls in the middle. Fold the other half of the plastic over the ball. Press once, gently. 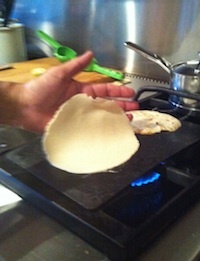 Then turn the plastic-wrapped tortilla 180° and press a second time, firmly. Tortillas will start to puff up when cooking. A) Gently peel off the plastic from the top of the corn tortilla. B) Use the plastic to remove the tortilla from the press and place the uncovered side in your right hand, assuming you’re right handed. C) With your left hand peel off the the plastic from the other side. 6. Cook it for about 30 seconds. Then use a spatula to flip it and cook the other side for 30 seconds. If you overcook them they will be dry and yukky. Keep the cooked tortillas in a bowl, covered with cloth to retain the moisture. Whether you serve these tortillas with scrambled eggs, avocado, beans, or eat them with just a bit of Serrano salsa, notice the chewy, creamy texture, and the unique roasted corn taste and aroma. ¡Buen Provecho! Berzok, L. M. (2005). American indian food. Westport: Greenwood Press. I agree with you, David, that many GMO crops have positive benefits. I am not against GMO crops. I am for a more informed and transparent discussion about GMO food labeling, and related to the GMO industry, an open, grassroots discussion about the restricted control of food and seeds, un-discussed laws regarding food patents, the political and economic difficulties that inhibit unionization of food laborers. Love the blog. Direct, unpretentious and delicious like the food. Someday I hope you will reconsider the entire anti-GMO thing though. GMO crops are feeding the world and are in many ways the margin between hunger and good nutrition for literally billions of people. They are a blessing to the world and not a curse, even though millions have been persuaded that they are somehow evil. You have a long productive life ahead of you, I trust. As you go forward keep your mind open to change and progress of all kinds and look carefully when you have the time at the anti-GMO premises. There is some Mexican corn that is not GMO, and I hope you’ll join me in making corn tortillas and lobbying for Monsanto to stop. Have a delicious day! Adan, I love homemade corn tortillas! It’s that GMO thing that makes me decide most often to make flour tortillas. I make those with organic unbleached flour. But I can smell and taste these gorgeous corn tortillas of yours!